Hypnosis glasgow hypnotherapy glasgow hypnosis gastric band hypnotherapy lose weight hypnotherapy glasgow. Fern Britton’s ­rapidly diminishing form is ­testament to the ­growing popularity and effectiveness of obesity surgery, but it takes great ­bravery — and a degree of desperation — to go under the knife to lose weight. For the thousands who undergo gastric band surgery every year, the operation is only part of the story. To lose weight, they must adhere to strict portion ­control, slow eating and ­repetitive ­chewing to accommodate their ­dramatically reduced stomach capacity. It’s a very different way of eating, but one which — even without the band — offers the promise of steady, safe and ­long-term weight loss. 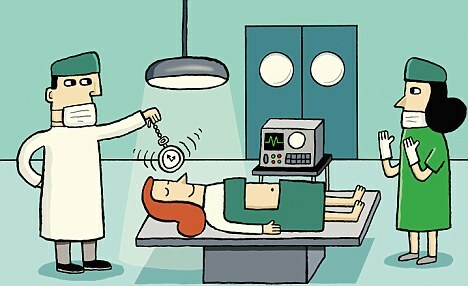 So when a patient asked ­hypnotherapists Martin and Marion Shirran to hypnotise her into thinking she’d had a gastric band operation, they realised they’d hit on something. For the past three years they have been running a successful clinic in Spain ­offering a programme of what they call ‘gastric mind band’, combining ­hypnotism with a programme of ­education, which allows patients to ­successfully lose weight just as ­effectively as if they really had had surgery. Now they have released a book packed with tricks and tips, as well as a clever self-hypnosis technique to convince you that your stomach has shrunk. Here, Martin and Marion explain how it works. The key to making your gastric mind band work really effectively is to eat small portions, very slowly as if you really did have a gastric band. After surgery, the banded stomach is reduced in capacity from around one litre to just 20ml. The most you can eat in any meal is six tablespoons of food — ­compared to the average meal the size of two clenched fists that would fill a ­normal capacity stomach. With gastric mind band you don’t have to be so restricted but, from now on, no portion of meat should be bigger than a pack of playing cards (around 3oz) and a healthy portion of fish should not be ­bigger than a cheque book (4-5oz). Your portion of pasta, when cooked, should not be bigger than your fist. Take smaller bites, chew it properly, eat more slowly and concentrate on what you’re eating. If you eat quickly, you’ll eat more because, by the time your brain gets the message that you’re full, you will have swallowed more than you need. Try using chopsticks or swapping ­cutlery hands to slow yourself down. Gastric band patients are encouraged to eat their meals in a certain order (meat first, because it hangs around in your tiny new stomach for the longest time). If you find you’re feeling full before you get to the potatoes … STOP. After real surgery, no fork-full of meat can be bigger than the nail on your little finger and must be chewed ten times to ensure it is properly digested. You are not so restricted, but make every mouthful count. Study the colour and texture of your food. Analyse the taste — your taste buds are in your mouth, not your stomach, so the longer the food stays in your mouth, the more ­pleasure you’ll obtain from it. Eat slow, best bits first, and be happy about leaving some on your plate. And stop worrying about ­wasting food. Excess food is wasted whether it passes through your body first or goes directly in the bin. Don’t treat your body like a bin. You deserve better. People who have had ­gastric band surgery lose weight slowly, a few pounds a week. By eating sensibly as they do, you can do the same. To lose 1lb a week, you need to cut back by 500 calories a day — by ­making a few small adjustments the calorie deficit can soon mount. It’s that glass of wine or handful of crisps before dinner. Say no once, and you’ve got 500 calories in hand. There are are only two types of meals — the ones that matter (a meal with friends, or with a partner, perhaps on a Friday or Saturday night) and the ones that don’t (the rest of the week). Enjoy a bottle of wine or a desert occasionally but, five nights a week, your meals don’t have to be gourmet. Think scrambled egg or beans on toast. Spread butter on your toast, but be aware that a teaspoon of ­butter (enough for a thin layer) is 37 ­calories, but a ­tablespoon (a ­generous covering) is three times as much (111 calories). Put dressing on your salad, but learn to weight the vinegar in favour of the oil. A teaspoon of oil may be 45 ­calories, but a tablespoon is 135. That one extra tablespoon of oil every day amounts to a stone weight gain over a year. Switch to sweetener in your tea or ­coffee. Cutting out two spoons of sugar in your tea three times a day creates an annual calorie deficit of 37,000 calories, which could be enough to shed more than 11lb. Have ice cream occasionally, but just one scoop (about 150 calories) and never eat it straight from the tub. Enjoy a few nuts with a drink, but stop at one or two (a small 4oz bag will set you back 600 calories). Food and sweet drinks are so much a part of our everyday lives, few overweight people remember what true hunger feels like, but it is ­important — for the gastric mind band to work — that you eat only when hungry. When hunger strikes, try drinking a glass of water. In the clinic, clients will, under ­hypnotherapy, go through the entire ­process of having a gastric band fitted in hospital complete with sound effects and hospital smells. But you can achieve similar results through self-hypnosis. Get a golf ball and, before you go to bed each night, lie down, holding it in your dominant hand. Talk yourself into a state of deep ­relaxation by picking a spot on the wall or ceiling in front of you so you have to raise your eyes slightly to keep fixed on it. Imagine you are holding a remote ­control for your life. When chocolate enters your brain, hit pause. Imagine yourself eating the ­chocolate. Fast-forward to five minutes after you’ve finished. Are you feeling guilty? Sick? Rewind back to the present — imagine resisting the temptation. Fast-forward to five minutes ahead again and see how virtuous you feel. Hit your pause button to remind ­yourself of the consequences of indulging your craving. You do have the power to control cravings — it’s your choice. Repeat this three times then, slowly, count down from five to one, taking a deep breath in between each number. As you reach one, close your eyes and allow yourself to relax. Imagine a beautiful staircase with ten steps leading down to a special place where you feel safe, comfortable and relaxed and count slowly down. When you get to one, picture yourself in your special, private, safe place. Now you should be relaxed and ready for the ­visualisation part of the exercise. Clench your fist. That’s about the size of your stomach, but imagine it tightening and shrinking. Squeeze the golf ball. Feel the size of it. That’s your capacity for food. You’re not going to be able to eat as much as before and you’ll feel satisfied with smaller ­portions. Picture a band being wrapped around the top of your stomach. Squeeze the ball tighter as you imagine the band being clicked into place. Breathe deeply, then very slowly count yourself up from one to five imagining that you have enjoyed a wonderful ­relaxation. At five, you will move into a normal and natural sleep. Hunger = If you haven’t eaten for three hours and you have an empty rumbling sensation in your stomach. Desire = If you’ve just had a big meal and you want more or you last ate two hours ago and food is on your mind. Craving = A strong urge to eat a ­specific food, usually after smelling it or seeing someone else eating it.